I have normal/dry skin and I prefer light textured moisturisers. This sorbet style moisturiser was absolutely lovely, the whipped light consistency was unique and felt super light and feathery on the skin. My skin absorbed it really quickly, which made it my go to moisturiser before wearing makeup as it didn’t feel greasy. 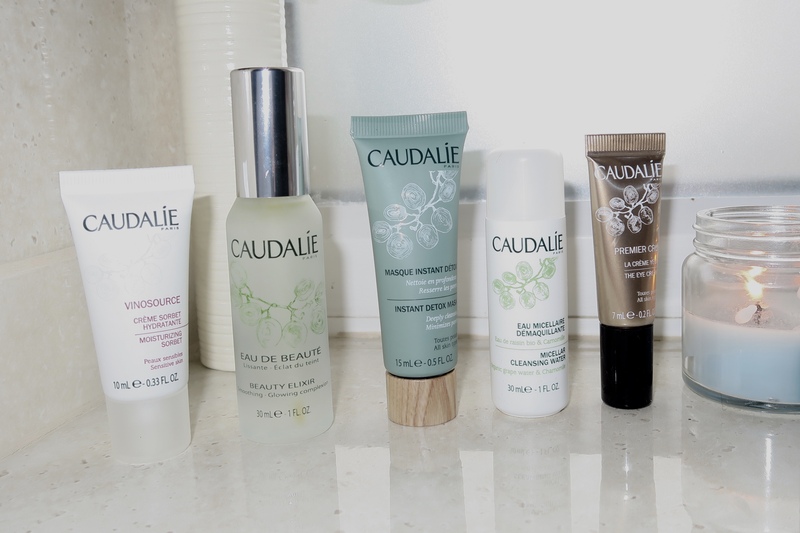 I absolutely love the vinosource range (especially their serum) which is what convinced me to slowly but surely transition all my skincare range to Caudalie. This isn’t no award winning product for a reason. It has a very distinct smell to it, you either love it or hate it. I absolutely love this product, I cannot remember how its existence came into my life nor do I remember when, but all I do remember is that it’s been a part of skincare regimen for a long time and definitely one item I cannot do without. I promise I use this stuff religiously, it tones, tightens and preps my skin – letting me have good skin day, everyday – with or without makeup! How I typically use this is before wearing makeup and then re-spritz it when my makeup needs a bit of zing and refreshening. A good cleansing clay based mask. I’m not 100% sure about it and don’t think i’d repurchase as I do have my favourites already. However, this is a good nifty little one for on the go, perfect little travel buddy. It does make the skin feel a little tight afterwards, so a lovely thick moisturiser is needed afterwards. A good product, works well but nothing exciting pops out as it works like any other micellar water that’s on the market. I’m really bad at remembering to use eye creams but I’ve really made an effort with this one and can say I’m really enjoying using it. It’s made my under eyes look brighter, hydrated and glowy. There’s definitely a healthier sheen under the eye when I use this product. After a consistent usage I’ve noticed the lines under my eyes are minimal – however, I wouldn’t say it’s great for removing the darkness. Bold claims I know, but whether thats from staying hydrated or getting a lot of sleep, my under eyes have been looking and feeling great with consistent usage of this product.